Between the front and the back of the page, there’s a little triangle, a little space with printed text. This in-between page, a feature that occurs six times in Smoke in My Dreams, is surreal and unexpected, like the 7½ floor in Being John Malkovich or Platform 9¾ in Harry Potter. This strange corner illustrates the dream-like quality of the work. 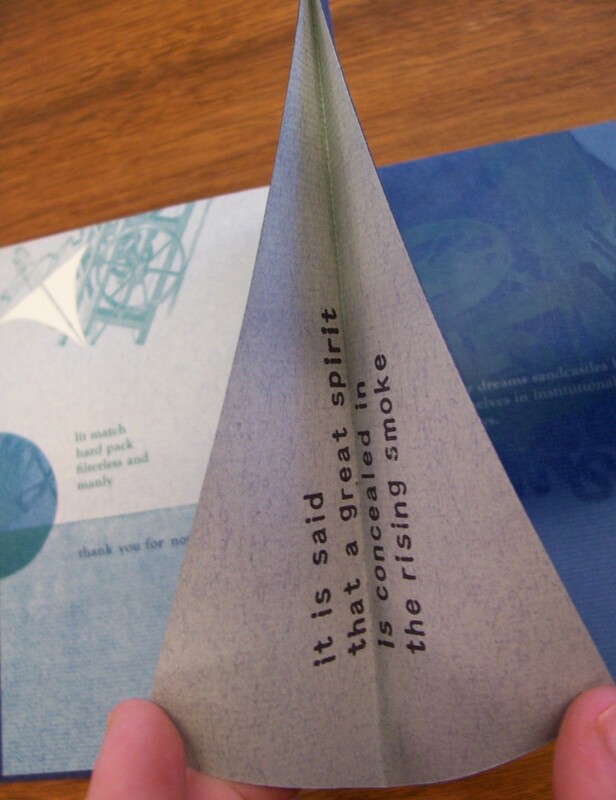 Mark Wagner’s Smoke in My Dreams is part of the Smithsonian American Art Museum/National Portrait Gallery Library’s collection of artists’ books. Artists’ books are interdisciplinary works that contain a combination of text, images, unconventional bindings, unusual or handmade materials, and/or interactive features like pop-ups. To create Smoke in My Dreams, Wagner used letterpress printing, collage, drawing, and painting. Though the book is in an edition of 70, the collaged and hand-drawn illustrations mean that each copy is unique. Completing all the copies took Wagner nearly a decade. The text of Smoke in My Dreams describes the way that smoking pervades the narrator’s life, even filling his dreams. At night, the narrator experiences the desire, addiction, danger, and repetition of smoking, but it is tinged with the surrealism of dreams: “in my dreams there is an extra / organ where the smoke gathers, / somewhere between my mouth / and my lungs.” While he knows that smoking in real life is self-destructive, smoking in his dreams seems to be safer. Meticulously constructed, the book’s visual collages are influenced by the strange logic of dreams. The collages primarily use images from cigarette packs and stamps that have been carefully cut, placed, and pasted to the page. The pyramids, palm trees, camels, and minarets of the Camel cigarette pack appear throughout the work, creating small desert scenes. In one page spread, a window opens to a view of city with palms and minarets. Some of the minarets are collaged from Camel packs, while others are made out of black paper. The terse, poetic text declares that “in my dreams tobacco cities / crumble into ash.” Wagner has carefully cut postal stamps along their cancellation marks. These cut stamps make wavy lines that resemble smoke. It looks as if the city is burning: the scene, constructed from a cigarette pack, is a tobacco city crumbling into ash. 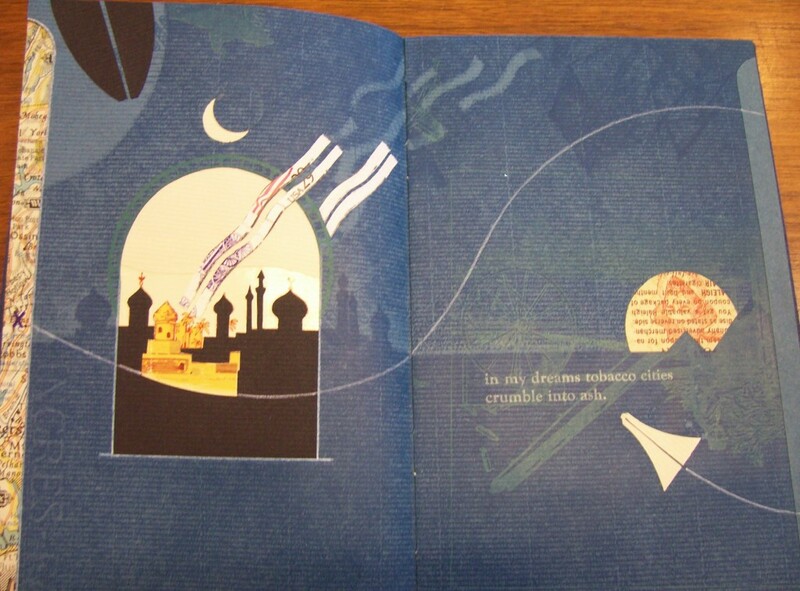 In this spread, as in all the spaces of the book, it is difficult to tell what is inside and what is outside, and to tell what is real and what is a dream. A shadowy horizon line is visible around the window, as if it is possible to see through the wall. A collaged moon, visible above the window, seems to be inside. On the right, a sun made from a Raleigh cigarette pack rises behind triangles, which look curiously like the pyramids on a Camel pack. The thin, hand-drawn curving trail of a paper airplane, or perhaps the nib of a fountain pen, seems to guide the viewer’s eye across the pages, echoing the narrator’s dream voyages. It begins on the left, where an X is drawn on a map near Tarrytown, NY. 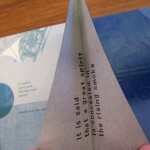 The paper airplane’s trail swoops across the window, circles the rising sun, and points to the text. The narrator’s dreams are like the journey of the paper airplane, traveling inexplicably from bed at home through a surreal landscape. The landscape of dreams is like collage, combining pieces of daily life into a new and strange order. The paper airplane/pen nib shape also resembles another element of Smoke in My Dreams – the little space of the in-between pages. The trail of the paper airplane takes the reader through the landscape of dreams and back into the book. The repetition and transformation of this shape throughout the book shows just how surreal and clever Smoke in My Dreams is. You can see Smoke in My Dreams, along with other artists’ books from the Smithsonian American Art Museum/National Portrait Gallery Library, at the Material Meanings exhibit.